My wonderful sponsor Victorious Youth is letting me give away this darling vintage pearl tie necklace to one lucky reader! It looks so cute with a collared blouse (such as the sweet polka dot blouse it's shown with) and I can definitely picture it paired with some swingy little dress. 1.) What is your favorite item from the Victorious Youth shop? 2.) What is your favorite part of Fancy Fine and what would you like to see more of? The winner will be announced on February 19th and the contest is open to international readers! I love the vintage crochet lace dress! And my favorite part of Fancy Fine are the beautiful vintage dresses you own. I really like the subtle tulip print. As for your blog, I would love to see more of your visits to flea markets or perhaps even vintage shops? You mean I have to pick just one? Ok, the leather cut out flats, I just love vintage shoes, but these are not my size, darn! Favorite part of Fancy Fine, the outfits that you put together. I really love the Vintage Navy Gray Tabby Pinstripe Dress. I think you put together some really fabulous outfits; I love them! I really enjoy when you interview your sponsors and would like to see more of that. I reallyy love the Vintage YOUNG TIMERS Woven Plaid Mini. I think its absolutely adorable. My favorite part about Fancy Fine would have to be all of your amazing vintage outfits. They're spectacular! i think my fave item is the Framed Silhouette Pin. Its a classic accessory that would look great with just about everything. As for your blog, I love the outfit posts and candid pics you post with your friends. I think the long floral and striped skirt is gorgeous, and one of my favorites. I'm really in to long skirts, and it's perfect. I love fancy fine because the clothes are totally vintage with out being tacky. And your a great writer, and I'm always entertained by the post. I don't think anything would make better then it all ready is, but more outfits, like this post, would be cool. i love the red bow mini dress! i love the photography on your blog, esp when you use the ol' point and shoot film cameras. 1.) I love, love, LOVE the 1980's Leather Skirt with Suspenders! I mean, really? Wearing leather with suspenders? I like it! 2.) If I had to pick my favorite part of Fancy Fine, it has to be the adorable, picked-straight-from-the-oldies dresses you always showcase! I love them and they definitely inspire the vintage side of me. I would like to see more of the way that you decorate a space! I feel like your style would be so cool to see! Well, besides the lovely tie, I love the Saks Fifth Avenue Polka dot blouse that I believe is featured with it since they work so well together! I adore Fancy Fine, and my favorite part of the blog is seeing you and your friends out having a good time! It seems like you lead such a fun life! Vintage GEOFFREY BEENE Navy Crepe Dress because I love any dress with a full skirt, sleeves and a high collar. my favorite part of your blog is definitely the photos of your outfits and your friends! *What a lovely shop! So many great things but I *really* love the Geoffrey Beene navy crepe dress. *I really love the Fancy Friends feature! I also just love to see your outfit posts - your mix of prints and shapes are always especially inspiring! my birthday is on the 18th so *fingers crossed* that i get lucky! I love the sweater with the teeny kittys on them! I'm a sucker for anything with cats. As for your blog, don't change a thing! It is seriously one of the best blogs out there, and I think it is because your personality and "realness" shine through! My favorite item from Victorious Youth would have to be the Vintage GEOFFREY BEENE Navy Crepe Dress. I know that it is the most expensive item in her shop, but it is also the best. My favorite part of Fancy Fine would have to be the silly about town poses and the truly "fancy fine" vintage ensembles you wear. 2). I would like to see a tour of your closet along with individual shots of some outfits you would put together. 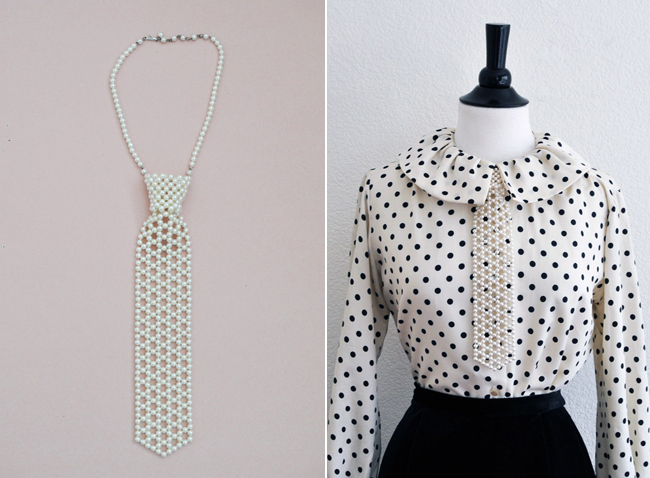 I really, really like the pearl tie itself! But other than that, I'm a big fan of the pleated maroon lace blouse. My favorite part of fancy fine is your inspiring outfits! Thanks for the chance to win! I love the 1960s floral skirt. The print is just so perfect, I've never been able to find one like it! Favorite item: Vintage Navy Crochet Shoulder Purse.My favorite part of Fancy Fine is ideally your outfit photos and I would like to see more of your personal life or your thrift finds. 1. My favourite item on the site is the red bow mini dress. I think I'd probably have to have a skirt or something underneath it as I'm not sure the length would be too decent, at least not by Victorian standards, but it is lovely. 2. My favourite thing about your blog is the fact that you can still publish bare-legged summery photos in WINTER. I have been sat here for three months in my thermals, lapping up your San Francisco roof-top shots, dying inside and living vicariously through your blog. I adore theVintage Pink Polka Dot Baby Doll dress. It is just so cute and I usually don't like pink things very much. I love everything on your blog but I guess more of your lovely pictures wouldn't hurt. I adore you! That pearl tie is awesome, as is the Geofrrey Beene Navy Crepe Dress. My favourite item is the '80s Striped Sweater with Cats and Flowers. My favourite part of Fancy Fine is your visits to flea markets. My favourite item is the 80s Striped Sweater with Cats and Flowers! My favourite part of Fancy Fine is your trips to flea markets! 2. i come to Fancy Fine for your sense of style - you inspire me to pair things together that I wouldn't normally! I'm sure almost everyone will answer thism but the cutest item in their shop is the 80's striped sweater with cats and flowers! It's so cute! But it was a tough choice between that and the 70's jantzen floral wrap skirt and the frames silhouette pin :) and maybe that pink striped and polkadotted shirt, I don't know..
My favourite part about your blog would be your humour! Your posts are always such a pleasure to read (accompanied by your beautiful outfits, of course). 2. I like your Fancy Friends feature. It's so cool to see your friends' awesome styles. You're all so...well, fancy! my favorite thing are the Vintage Rectangular Pink Earrings with Silver Accent, and the best thing about Fancy Fine are the tone of your writing! 1. My favourite thing is the maroon lace blouse. It's so elegant the lace detailing is absolutely beautiful. 2. I am constantly inspired by Fancy Fine. Your sense of style has made me consider how I put my outfits together; the colour palettes you use are beautiful. And, being in dreary Northern Ireland, it's nice to live vicariously in lovely San Fran! I'd like to see more Polyvores! And I love little Donut's face! Faceted Triangle Stud Earrings are very pretty! and what i love about your blog is your writing. you are very straight forward and open in how you write. its very refreshing! I have to have the vintage gold bow pin. I just do. i like the saks fifth avenue polka dot blouse and I would like more ouftit posts. I have to have the vintage gold bow pin from Victorious Youth. I just do. I love how your blog inspires me to shop vintage. So many great pieces! I really like the Noir sequined top. I love your outfit photos and shop updates--clothes, clothes, clothes! I really love the Vintage Espadrille-esque Sandals! That is soo awesome! I've never seen anything like that. My favorite item in the shop is the Polka dot blouse with ruffle collar! The pink polka dot shirt is really cute too. I love everything about Fancy Fine. I really like how you always include your fashionable friends too! I think everything you do on your blog in general is fine. I think I love the outfit posts the most. Wow,this shop was already on my favorites list on Etsy. It's nearly impossible to pick just one favorite item but if I had to narrow it down it would be the noir sequined sleeveless top, Sarah Taylor Floral and Polka Dot Print Dress and after five velvet cocktail dress! What I love most about your blog is your INCREDIBLE collection of dresses and you make everything look awfully effortless. There was this hot pink dress you'd worn several posts ago and that's what really drew me to this blog.I have been looking for something just like it with no luck! 1. My favourite thing in the shop is the 'Vintage NICOLA Primary Colors Checkered Blouse'. I just love the crazy colour and pattern. I also love the prize! 2. MY favourite thing on Fancy Fine is the outfit posts. & your haircut! I would like to see more photos of flea markets. 1.) I love the 1990's Polka Dot Party Dress. So cute! 2.) I love everything about Fancy Fine. I would love to keep seeing your outfit posts! 2) my favorite part of fancy fine are your daily outfit posts and your random posts showing your collections of clothing and various vintage collections! Oh, it's been a long time since I visited Fancy Fine for the last time, it's nice to see a giveaway :). I'm in LOVE with that 'Sheer Red Valentine Dress'! It's gorgeous. My favorite part of Fancy Fine... hmm, the outfit pictures, of course! And the way you make everything you wear looks so fabulous. :) Sorry for the bad English! i would like to see more vintage jewelsry. 2. you are pretty much my style soulmate so your clothes are my fave part of fancy fine. i would like to see some more features on where you find all your beautiful vintage dresses and your favorite shops. this tie is unbelievably darling. my favorite item at victorious youth would have to be the vintage yellow tulip apron, though i'm happy to say it was a difficult choice. what a great shop! my favorite part of fancy fine is the incredible purikura shots. i loved your blog before i saw those, but that solidified by intense respect for you. seriously. 1. My favourite item has got to be the vintage dress with bows and flowers (http://www.etsy.com/listing/67735821/vintage-dress-with-bows-and-flowers). Such a great print! 2. I know I am a new visitor but I went through so many photos and found that my favourite part about Fancy Fine must be your flea market expeditions. I love to see what you see at your flea markets and look through the gorgeous pieces that you've shown in your photos. I definitely want more of that. The Victorious Youth shop is very well-edited! I had a hard time choosing one favourite item, but I guess I would go with the pleated maroon lace blouse. I really like the cute Polyvore ensembles that you put together, they are classic and quirky. I am also in love with your personal style. Hmmm the necklace is just too, too lovely to pass by. Favourite thing in the shop is the mandarin cap sleeved dress - although it was hard to narrow it down. How can I possibly pick one, umm? The Sheer Red Valentine's Dress is beautiful. I don't even wear red that often, but this dress is beautiful. Well, Fancy Fine is just so inspirational on so many levels. Obviously, I adore the way you dress. My favorite part would be everything! I love the humor in your writing too! I love the Vintage Navy Crochet Shoulder Purse!!! It's too cute! My favorite thing to see on Fancy Fine are your personal style posts! I love seeing how you make vintage pieces work! my favorite item in the VY shop is definitely the 80's cat sweater with flowers ... um, whats cooler than a cat on your sweater?? It is hard to narrow down what my fav part of fancy fine because i love every post but when it comes down to it, your outfits! such great style ...all the time! polka blouse with ruffle collar. i love your sunny vintage vision but what sets you apart from the rest are that you include pictures from your life - your friends, parties, drunken nights - always in top vintage style with that same sunny vision. I love the connection between the Fancy Fine blog & shop - I think your photos for Etsy wares are so helpful and beautifully done. And, more generally, it's so lovely to see someone with great classic feminine style. A true role model. Only recently discovered yr site, but what a find! More of the same, please! I'll be back! i love the purple star earrings! and i love to see youw ith your friends. such fun! My favorite part of Fancy Fine is the party features! I love having a glimpse of the fun parties you attend/host. Whoa, that's an amazing necklace! My favorite item in the shop would have to be the confetti dress. One of my favorite things about your blog are the color pairings you come up with--I also like the fun candid photos though! And my e-mail is katymburnett at gmail.